And so it begins! Today marks the official start of my Double Wedding Ring Quilt along. If you're participating and have a blog, feel free to share the love and post my button! You can grab the code if you look on my right sidebar. A big thanks to my friend Brenda and her computer-whiz boyfriend for putting this button together for me :) And don't forget, if you still need to order a bundle (or other cute fabrics for your stash that have absolutely nothing to do with this quilt along *wink*), you can use the coupon code TPSQAL in her Etsy shop to receive 15% off your order - woot woot! *NOTE: Starting at this date, I moved the schedule back a week from what was originally planned. These dimensions and supplies are based on the original pattern we're using. If you're interested in making a quilt that's a bit larger, there's been some discussion about it here. Also, I know there are two camps out there when it comes to prewashing, and I'm not trying to rock anyone's world, but I strongly recommend prewashing your fabrics before you embark on this quilting adventure. The piecing is very intricate, and I would hate for you to spend all this time making a beautiful quilt, only for the fabric to warp or bleed the first time you wash it. I understand everyone has their reasons and preferences, but I think it's better to be safe than sorry in this instance! You'll need to cut forty (40) 2.5" x 2.5" squares from each of your two prints. What I did is fold each print in half, selvage to selvage, and cut three 2.5" strips along the width of the fabric. Then I sub-cut each 2.5" strip into the required 2.5" x 2.5" inch pieces. Next I moved onto the actual arc pieces. You will need to cut these pieces slightly larger than the intersection squares - the finished size will be 3.5" x 2.5". To complete the quilt top, you will need to cut exactly 37 squares from each of your 13 prints. Not to scare you, but if you purchased 1/3 yards like me, be careful when you cut because you have exactly enough fabric for your squares (with only an inch or two of breathing room). The procedure for the arcs is much the same as the intersection squares. Fold your fabric in half, selvage to selvage, and cut three 3.5" strips across the width of the fabric. You should be able to get 16 squares from the first two strips, and 5 from the last. On the last strip you'll only need to make three cuts, which will give you 6 squares - the extra square and remaining strip can go in your scrap pile. And voila! Here are my finished arc & intersection squares! Good Folks is my favorite fabric line ever, and I've been hoarding it for a DWR quilt for quite some time! I can't wait to finish it for our new home :) I'm using Kona Buttercup for my background solid. Next comes the fun part: tracing your melons and center pieces. I'll be gut level honest and tell you that most of the trouble I had piecing my last DWR came from poorly cut melons and center pieces. Here's the problem - the more you trace and transfer the shape, the more "off" your final cut pieces will be. So here's what I recommend. Trace your melon onto a piece of template plastic, and cut the plastic piece out. Place your original paper version on top of the template plastic one, line them up, and trim off the excess. Be as accurate as possible! Even tiny little 1/16" overhangs can screw you up! As for the center piece, I recommend making a template half the size of the one given in the pattern directions. I cut out the quarter piece provided on the directions, lined it up on my template plastic, and traced. Then I flipped the paper over to create a mirror image, and traced the shape again. I laid my paper piece over the finished template below so you can get a visual of what I'm talking about. The grid-lined template plastic (purchased in a pack at Joann's) really helps with this step because you can make sure everything is straight before you begin tracing. Again, you'll want to place the paper template over the plastic one and trim once you're finished. Now you can start tracing! Along the width of your fabric, fold up a 5.5" piece. Place your center template on the fabric with the bottom edge lining up with the fold. Trace as many centers as you can across the width of the fabric with a water/air dissolving pen and cut (you should be able to get 4 per row). Before I begin cutting, I like to pin the two layers together to keep them from shifting (thereby distorting the shape) while I cut my shapes. Once you finish cutting those 4 centers, trim off all the wonky hanging bits, fold another 5.5" over, and repeat the process until you have 16 center pieces. For the melons, place the plastic template on the fabric and trace 40 of them. Just like you did when transferring the template from paper to plastic, line up the plastic template and the fabric piece after cutting. Trim off any excess. As you can see in the photo below, even though I was meticulous with my tracing and cutting, the tip of my melon ended up being about 1/8" too wide. Bottom line - the more accurate you are with your tracing and hand-cutting, the more time and frustration you'll save yourself in the end!When I made my DWR last summer, I was going crazy trying to figure out why the fabric was always bunching up in the corners no matter what I did. After ripping my arcs and melons apart about 20 times (not exaggerating), I realized the tips of my melons were too wide, which was causing the fabric to bunch up at the point where the melon and both arcs met. One moment I was ready to burst into tears and give up, and the next a light bulb went off and I was sailing along piecing curves. What kind of long rotary cutter is that? I was wondering about your cutter, too. Do tell! This might be a good project to use freezer paper templates. The extra 1/8 inch is from your pen. If you make freezer paper templates, check to be sure they are accurate, iron them on, cut them out, pull off the templates and reuse them, you won't have that problem. Don't know if you already tried them or not. Best of luck on such a huge project! I had a question about the arcs that we have to cut out - I see that there are 2 lines - dashed and solid. I assume we are cutting on the dashed line - - but once the fabric is sewn on will we cut on the solid line?? I wanted to know if I should cut OUTSIDE the dashed line or right on the dashed line ... does that make sense??? Uh , yeah--- I wanna know about that fancy rotary cutter! :) With all these quilts going lately, oh, I would SOOOO love that- I have a really hard time holding the ruler straight- even with the suction cup handles- HA! And Good folks- now I'm drooling everywhere!! :) Beautimous!! It's a 24" Fiskars rotary ruler (item #F9519). They discontinued them a couple years ago and I have NO idea why. It's the best tool ever because it's heavy and has a foam strip on the bottom, so your ruler doesn't shift AT ALL when you slide the attached rotary cutter down. They really need to bring them back because people are constantly searching for them on the internet and eBay. @Laura #2 - You will cut on the solid line. 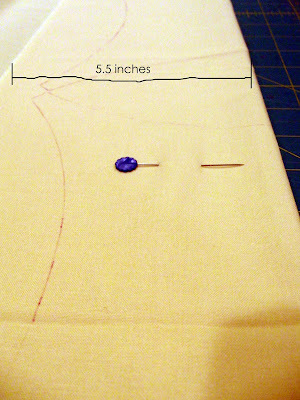 The dashed line is showing you your seam allowance because that's where you'll be sewing - 1/4" in from the solid line. I would definitely love to take part in this quilt along :) But first I have to buy template plastic and fabrics (Could that work with a jelly roll and additional yardage). 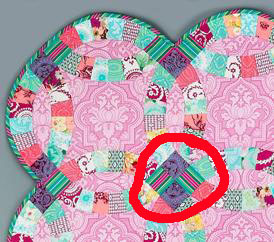 To anyone else who bought Brendas' precut purple fabric set...which two fabrics did you decide to use for the corners?? I am terrible at choosing this kind of stuff. Nice! 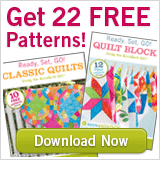 I am going to have to save this because I have wanted to do one of these quilts for a while now!